»Astro Perspectives»What about an Opposition? The Full Moon is a good time to explore the energy created when planets oppose each other from across the zodiac. Traditional Western astrology uses the Tropical Zodiac, in which each sign is allocated 30 degrees, and they follow a specific order. We usually start the order with Aries – the sign traditionally associated with spring. Opposite Aries, or 180 degrees away, is Libra, the sign associated with the fall. Cancer is the summer sign, and opposite it is Capricorn, the winter sign. Right now, the planet Mercury is at 22 degrees of Aries, and is more or less opposite Saturn at 22 degrees of Libra. The Sun is in Taurus, and will be opposite the Moon in Scorpio this Friday, making our lovely Full Moon. A lot has been written about oppositions, and people who have them in their chart may have been told that they are ”challenging,” that they are “hard aspects,” that they mean something about conflict, or confrontations. Because a body at rest tends to stay at rest, and because I have a couple of oppositions in my chart, I like them. They get me up and moving. The Sun on one side of our sky map is shining full-face on the Moon on the other side, making us very aware of it. Any opposition does this – shining full face on the other planet, we become more aware. With this awareness then, we have an opportunity to make a decision. If you don’t know something exists, you can’t even think about it. Oppositions show us things; they shine a light where it had been dark or obscured. Oppositions reveal things to us; make us aware and cognizant of them so we can begin thinking about them. Thus, they are wonderful agents of change. They herald the coming of opportunities for change. That’s all very well when it’s a transit, a passing condition. 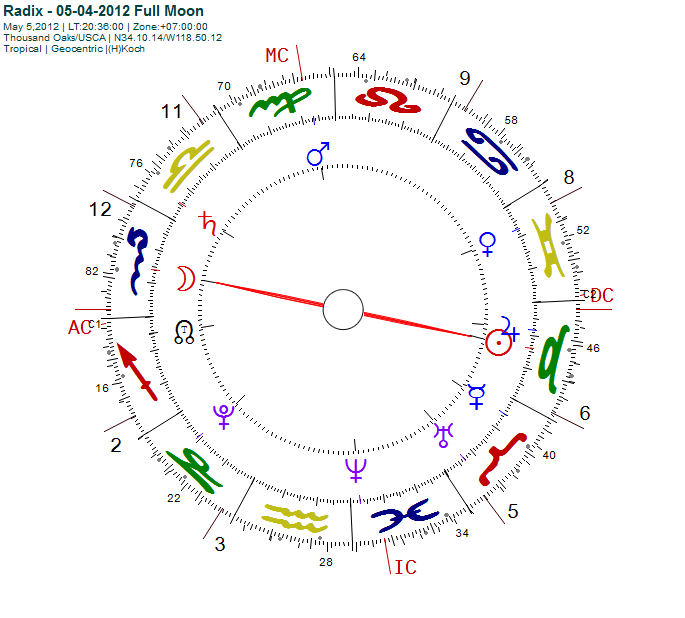 What does it mean for the person with an opposition in their chart? One part of yourself is always staring at and showing up another? Isn’t that a little intimidating? Well, it can be if you let it. The real value in having a good reading that helps you understand your chart, is that you learn the origins of these sensations – of being exposed, very sensitive, or keenly aware of some aspect of your person or personality. Once you know where it’s coming from and what it is, you are one step closer to managing it – or, even better, harnessing the value of that energy. The light shining across the zodiac can be a source of courage and personal power. Oppositions can provide clarity and focus. Once you transform the shyness or sense of exposure, you realize that you can see, use, and leverage a part of yourself that most other people can’t see in themselves. This realization is a real treat! Employed correctly, oppositions can be your source of talents, skills, and positive desires. They really do get you up and going and can be valuable keys to achievement and accomplishment. Like I said, I like oppositions!